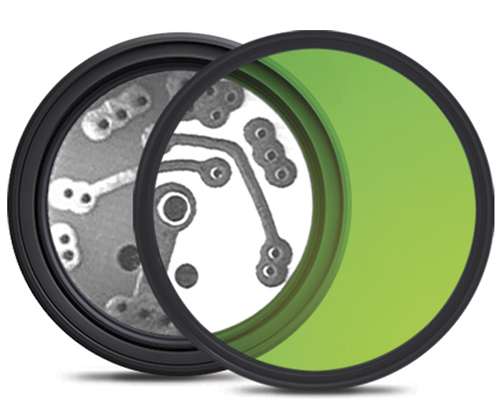 Optical filters are critical components for machine vision applications. They’re used to maximise contrast, improve colour, enhance subject recognition and control the light that’s reflected from the object being inspected. When selecting an optical filter for a machine vision system, there are a few key features to look for: stability, passband performance and anti-reflection coating. Stability: Because various angles are commonly used when imaging, having a stable filter is essential. Short-shifting can occur when the angle of light passing through a filter increases. This is most commonly seen when the filter is placed in front of a lens with a focal length of 12mm or less (lenses with greater than 50 (+/-25) degree angular fields of view). 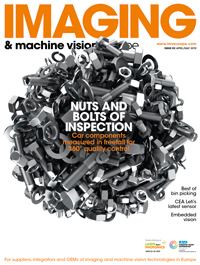 This accounts for almost 60 per cent of all lenses used today – a number that continues to grow as the demand for space forces inspection footprints to shrink. Choose a filter that is designed to work at variable angles and a wide field of view. Passband performance: Now that the filter is stable, it is also important to make sure that as much ambient light is blocked as possible. The most common type of illumination used in machine vision systems is LED light. To ensure a machine vision filter is effective, the position, height and width of the passband should emulate the bell-shaped spectral output curve of the LED illumination being used. Selecting a filter that is too broad can allow more unwanted ambient light to pass through the filter, while selecting a bandwidth that is too narrow can result in a loss of the desired illumination and overall darkening of the image, both of which can sharply reduce contrast. Anti-reflection coating: When a ray of light passes through a glass surface, a portion of the light is reflected, resulting in a 4 per cent transmission loss per surface. This means only 92 per cent of the light actually passes through the glass, and the rest is reflected from the surface, known as reflection loss. Look for a filter that uses anti-reflection coating to reduce surface reflection and increase transmission. This improves the efficiency of the vision system by allowing more of the intended wavelength to enter and by eliminating ghost images. A vision system’s stability, repeatability and performance is dependent on the information that enters the system. This begins with a proper machine vision filter. Sill Optics now offers a series of telecentric lenses with variable working distances. The range covers lenses with magnifications from 0.13x to 0.66x for sensors up to 16mm diagonal length, and magnifications from 1x to 3x for sensor diagonals of 35mm. Sill Optics designed the telecentric lenses in cooperation with Optotune. They are able to focus without any mechanical movement to give good performance over a given tuning range. Telecentric lenses are used for measuring objects of different heights. Unfortunately, users quickly hit the limitations of the exploitable depth of field. These new products allow telecentric measurements with temporally adjustable working distances up to image capture speeds of 40fps. The working distance is linearly proportional to the dioptic power (reciprocal of the effective focal length) of the focus tuneable lens element. The magnification of the lens is not constant because of the retroactive effect of the focal length. With calibration, this small difference can be corrected for consistent accuracy thanks to the linear behaviour. The lenses also offer an approach for measuring an object in 3D via a z-scan. The first prototypes have been launched, and Sill Optics gave a presentation on the potential uses of the lenses at Stemmer Imaging’s technology day in the UK on 16 November. Sill Optics also provides a modular telecentric lens set-up, which is able to adapt the standard series (polarised coaxial coupling) to meet the requirements of the measurement configuration. First of all, the beam splitter can be replaced by a non-polarised version, and furthermore the illumination homogeneity can be improved by a retardation plate. A smart mechanical solution avoids the necessity of an expensive external retardation plate for large object fields greater than 60mm. While traditional optical systems enable focusing within certain limits according to the required distance, one or more lenses must be moved along the optical axis to achieve this. This requires motors and mechanical guides, which limit not only the overall size and the response time, but also restrict the robustness and service life of any solution. Variable focal length lenses provide an interesting alternative for such applications. The technical basis of this is the variable curvature of a lens consisting of a membrane filled with fluid. If the pressure within the lens is altered, the curvature can be adjusted. A change to the lens radius of a few micrometres can achieve the same optical effect as the mechanical displacement of a lens by several centimetres. Optical systems can thus be designed to be more compact, often with fewer lenses and without any translational movement. Focusing can be achieved in just a few milliseconds by the application of current, removing the need for manual or motorised refocusing for imaging objects of different heights. This can best be seen in the example of a system for reading addresses on packages: the heights of such packages can vary continuously. Under these circumstances in order to capture the desired information in focus, the working distance to the vision system or the focus of the optics would have to be adjusted for each package, which often is not achievable with the necessary speed using mechanical means. The electrically tuneable lenses offer a wide range of optical power and thus the possibility to focus on objects at a wide range of working distances, and within milliseconds. A liquid lens solution is also very compact and can even be integrated in handheld devices. Without relying on any moving parts, millions or even billions of cycles are specified, significantly increasing the time before failure compared to alternative solutions. In addition, when compared to other solutions, the tuneable lens is definitely cost-effective, especially when the use of multiple camera systems can be avoided. Liquid lenses can be combined with conventional lenses and mounted either between the solid lens and the camera for macro imaging, or in front of the solid lens for longer working distances. A 200mm macro lens combined with a liquid lens will typically allow the focus to be adjusted between 100mm and infinity. As well as applications for imaging products of different sizes, liquid lenses are ideal for focusing on objects that aren’t flat or inspecting features at different heights. Multiple focal points and rapid refocusing can also reduce the number of cameras required for the installation. Fixed focus lenses have a working range that is limited by the depth of field. Increasing the depth of field requires the aperture to be stopped down, which reduces the amount of light reaching the image sensor. Liquid lenses avoid this problem and can allow the system to operate at lower light levels. The Optotune EL-16-40 is one of the world’s largest electrically focused lenses, with a clear aperture of 16mm; it can operate as either a convex or concave lens. Stemmer Imaging also supplies Gardasoft’s TR-CL series of industrial lens controllers, which have been developed specifically to control Optotune liquid lenses by means of a constant current drive. The Gardasoft TR-CL lens controller allows macro changes in lens settings to be completed in less than 10ms with accurate and repeatable focus and full temperature compensation. The TR-CL is fully GigE Vision compliant, so that any GigE Vision client image processing software, such as Cognex’s VisionPro or Stemmer Imaging’s CVB, can be used to view the lens properties and modify the lens controller settings.